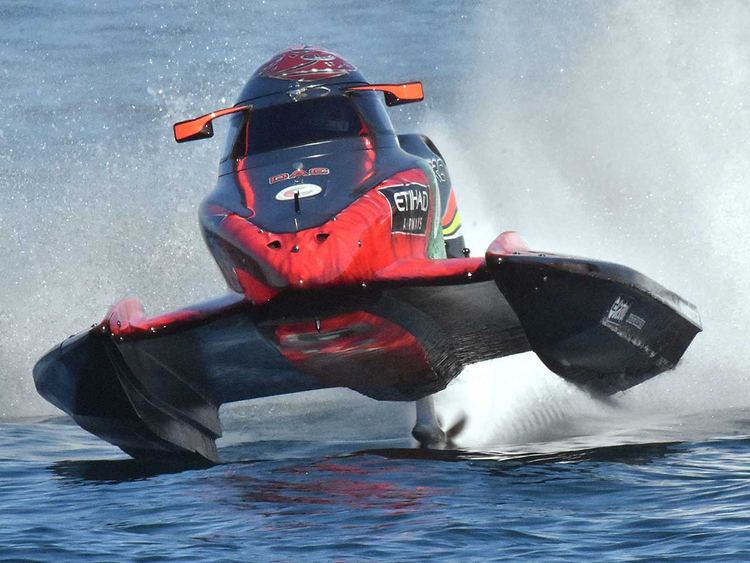 Dubai: Team Abu Dhabi’s top pilot Shaun Torrente has been spending sleepless nights as the UAE prepares for the final two rounds of the 2018 UIM F1H2O Powerboat Championships this month. The Miami resident is at the top of the drivers’ standings after his classy pole to flag finish while leading a third podium sweep for Team Abu Dhabi at the Grand Prix of India at the end of November. Now heading to familiar waters at the Corniche for the Grand Prix of Abu Dhabi this weekend, Torrente has been a bag of nerves chasing down a possible maiden world crown. The Team Abu Dhabi trio of Torrente, Erik Stark and Thani Al Qamzi have been testing the waters off the Abu Dhabi International Marine Sports Club (ADIMSC) since their arrival from India. “I simply have been unable to get some sleep,” Torrente told Gulf News from Abu Dhabi on Tuesday. Team Abu Dhabi have been the dominant outfit this season while pocketing 11 of the 15 available slots, including three successive podium lockouts in France, China and last week in India. Torrente leads the trio of Team Abu Dhabi drivers with three wins and a third place, while teammate Stark has two wins and a couple of thirds as early leader Al Qamzi is in third overall with three third places. With the last two races left, Torrente leads the championship with 72 points, while Stark is on 65 and Al Qamzi remains on 54, while Peter Morin is the closest challenger to Team Abu Dhabi in fourth with 39 points. Team Abu Dhabi look headed for a double as they lead the teams’ standings with 126 points, 53 clear of CTIC F1 Shenzhen China Team who are second with 73 points, while Team Amaravati follows in third with 32 points. “Honestly, I am just looking at finishing this off on a high, first for Team Abu Dhabi and then for myself,” Torrente said. Teams have already started landing in the UAE capital for this weekend’s Grand Prix of Abu Dhabi followed by the final round in Sharjah next week.